Each month, we’ll feature a Business Advisor of a different country to show how you can benefit from working with Agriterra. Richard van der Maden is the Business Advisor of December for the Small Farmers, Big Deal Campaign! He shares with us why he’s infected with the cooperative virus and why doing business with farmer cooperatives is beneficial for Dutch agrifood businesses. Richard: “I’m a farmers son myself; my parents owned a mixed crop and dairy farm. All my life I’ve worked in the agrifood sector and with farmer cooperatives specifically, but I focused mostly on the Netherlands and Western-Europa. 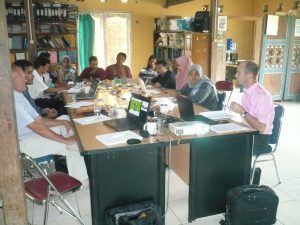 When Agriterra asked me to share my knowledge with farmer cooperatives in South-East Asia as an Agripool expert I was immediately enthusiastic. I always came back refreshed and inspired after each of these assignments. I enjoyed the interesting conversations with local farmers and I loved the ability to really influence the trajectory of local farming enterprises. After my fourth mission Agriterra approached me and asked if I wanted to apply my knowledge and experience to Agriterra fulltime. The work that I’m currently doing for Agriterra is a synthesis of all the different jobs I’ve held before coming to Agriterra. Compared to my previous jobs, my work area has increased ‘slightly’ to include a lot of countries in South-East Asia, although I’m mostly focused on Indonesia at the moment. “At the beginning of my career I become infected with the ‘cooperative virus’: I saw the immense importance of cooperatives to the financial stability, growth and quality of farms in Western-Europe and Scandinavia. Especially in the Netherlands we have a strong tradition of farmers joining together to weather good and bad times. The cooperative is still the primary vehicle to make a difference in the market. Even if you own a really large farming enterprise, individual farmers are no match for supermarkets or other market parties. The cooperative model is important for non-cooperative farmers as well because cooperatives make sure that the market prices for primary products are increased to a healthy level for farming enterprises in that particular region. “What I find most fulfilling is when our advice and training make a tangible difference. We invest a lot of time in adjusting our training and advice to local culture and practices, but the effectiveness of our work also depends on the willingness and ambition of the individual farmers and board members. 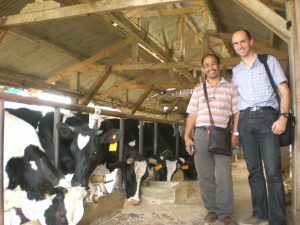 We’re currently working with quite a small dairy cooperative in West Java who are bursting with ambition and energy. We helped them formulate (and put to paper) a proper strategic plan for the future. With that strategic plan in hand they were able to attract funding for a new cooling installation. These kind of successes makes me very proud of my work. Next week, Richard will discuss why Agriterra is indispensible for Dutch agrifood businesses who are interested in working with farmer cooperatives.